The first map of the campaign setting (found here or here) showed a fairly small area of land, just enough space to show the three towns close enough to reach in a few days' travel of the starting point of the campaign. This weekend I put together a "zoomed out" map with hexmapper. In the coming days, I'll be adding details to the map. By the end of the week, I'll have named the major landforms as well as added notes on the population breakdown of different areas. Last time, I rolled randomly on the race tables in the World Builder's Guidebook to see where the dice would fall. I have mixed feelings about the results, so I'm going to change some things around until I am pleased with the racial makeup of the campaign setting. First things first, a region whose two dominant races are orcs and gnolls is bound to be far too savage for the setting I've envisioned. I certainly don't mind them being present, but making up for half of the region's population is a little much. If I knock them off of the top spot, I'll need two other races to rise up and fill their positions. The human race is an easy choice. Another traditional PC race would make sense on top as well, except that I don't necessarily want to just make the easiest choice. For now, I'm going to put elves in that position but I'm making a mental note to reevaluate that decision later on in the process. The next thing I need to address is that there are some PC races aren't represented yet. For the dwarves, this is simply because the rolls didn't fall there. Tieflings and dragonborn aren't even on the tables. I know that I want dwarves and dragonborn to be at least minor forces in the region. Tieflings, on the other hand, I think I'd rather see as a minority (even moreso than usual). I can't think of any other races off the top of my head that need to be there, so I'll just work with what I've got so far. Next, I want to make some cuts. Some of these races just don't interest me at all. Grells, for example, just don't do anything for me. They're first on the chopping block. Thri-kreens and doppelgangers will get the axe as well. Although doppelgangers are interesting, I don't want a large enough population of them to make the entire region paranoid. In those three slots will go dwarves, dragonborn, and gully dwarves. Yes, gully dwarves. My favorite character ever was a gully dwarf. But I digress... I'll share that story at a later time. Now that the list has been refined, I can look into some of the relationships between these different races. Hopefully I'll have the time to write that part up by tomorrow. This time, we look at plate tectonics and weather systems. In other words, where would natural disasters strike Vidarr? I'm not sure how much of this I would ever use in a game, as the disasters in my campaigns tend not to be very natural at all. They're usually caused by evil cults trying to upset the day to day lives of goodly folks. However, knowing the locations of volcanoes might very well come in handy. The fire giants need to live somewhere, right? 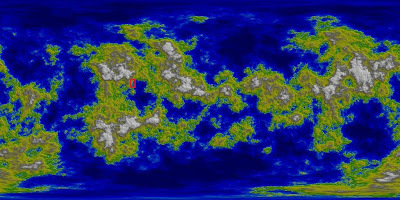 I'm not going to go into nearly as much detail as the World Builder's Guidebook recommends, but dropping a few currents and fault lines here and there won't take too much time. There might be a better way to do this, but for familiarity's sake, I inserted the world map into a PowerPoint and added arrows and such for the following images. Although this might prove useless in the future, it took all of 15 minutes to throw together. And while it isn't scientific at all, it will work. Perhaps this will lead to some inspiration down the road somewhere. Tomorrow, we'll look in more detail at the region in which the campaign will begin. Not since November have I added anything to the Shadow's Apex campaign setting. I'm not sure if it was the lack of spare brainpower during "Christmas + exams + new students" time of year or the fact that we've played so much science fiction and so little fantasy lately. Either way, my interest in world building plummeted for a while. It has only been in the last few weeks, with the stoppage of our Rifts game and the beginning of a new D&D campaign, that my writer's block has been lifted and my creativity restored. Note: It might also have something to do with reading The Hobbit with my Brit Lit students or the rediscovery of an old 2nd edition D&D favorite. 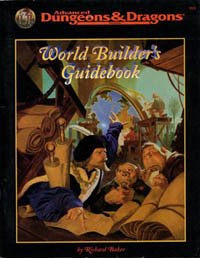 Just recently, I stumbled upon a source of inspiration that I forgot I even owned, the World Builder's Guidebook . This book has provided me countless campaign setting ideas in the past and was the first time I ever remember really thinking about building a world of my own, as my first experiences playing were with my father, who used the old Greyhawk map (though I'm not sure he used any of the actual setting information) and the first campaign I ever ran was set in the Forgotten Realms. Flipping back through this book for the first time in years, I've decided to go through the book step by step to further develop Vidarr, the setting for my still-in-development Shadow's Apex campaign. For those who weren't in the loop last fall when I began this little project, you may want to check out the Shadow's Apex Campaign wiki and/or the previous Shadow's Apex blog posts. However, as this and the following few posts will briefly hit the highlights of what has already been written, it certainly isn't necessary to go back. The beginning of the World Builder's Guidebook brings up various different approaches to building a campaign setting (macroscopic, microscopic, sociological, historical, etc). The creation of Vidarr has thus far been microscopic, focusing first on a very small geographical region, but it has some strong elements of the situation-based approach because I already know that at some point in the campaign one of the villains will attempt to merge the prime material plane with the Shadowfell. Next is the world hook. The book provides a good list of hooks for inspiration and a little elaboration on each one. Because I have envisioned Vidarr as a world on the brink of destruction, I think the "dying world" hook is the best to begin with, as the PCs uncover hints of a coming apocalypse in their early (heroic tier) adventures. The villain's plans will finally begin to come to fruition during the paragon tier and the PCs will be welcome to interact with the changes as they see fit. In other words, I really don't care whether or not they try to stop the prophecy from occurring. 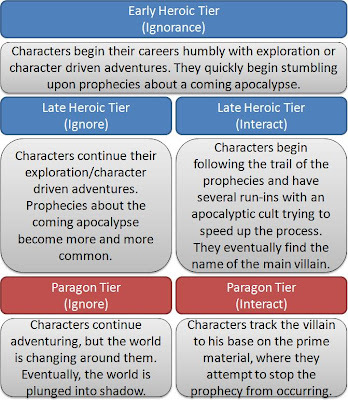 Then, as the campaign progresses, the epic tier will be defined by either a post-apocalyptic hook (as the characters deal with the consequences of the prime material and Shadowfell merging) or an extraplanar hook (in which the characters who saved the world from destruction are called upon to follow the villain to his home in the Shadowfell to end his madness once and for all). Any of the above scenarios are fine with me, and it is very likely that my players will inspire something else when the time comes. Only time will tell. Next time, I'll dig into chapter two for climate and geography. My wife has been trying to force me to attend a "Clue" party in the near future. In this type of party, each person picks up a persona and the game of Clue is somehow acted out in such a way that by the end of the party you know the murderer. I don't know exactly how it works... but it sounds a lot like live action role playing. In hopes of dissuading her, I tried to explain how she was plunging us both into the world of LARPing and I showed her a clip from Mama's Boy to emphasize the path she was starting down. It didn't work. In the end, I agreed... on one condition. "If you force me to be a LARPer, you have to play D&D once for every LARP-party you make me attend." I don't think she liked it too much, but she conceded. It isn't that she hates gaming. She plays Magic: The Gathering with us pretty consistently and she's becoming more and more a Wii nerd every day. Its that she claims she has no creativity or imagination. How do you argue against that? Now I'm stuck trying to figure out the best way to introduce her to the game. I know I'll use 4th edition (because the goal is getting her interested enough to play with the rest of the group and that's what we've been using lately). I'll probably use pregenerated characters (go Character Builder!). Beyond that I'm undecided. Perhaps a pretty linear dungeon with a few monsters, a few traps, and a simple skill challenge? In any case, I've got some time to ponder because the "Clue" party doesn't look like it will happen too soon. For now, I just want the community's opinion. Have you ever attempted to get your non-D&D (but gamer-friendly) significant other into D&D? What was successful? What failed miserably? Any funny stories?